What's on the Agenda for Buhari and Trump Meeting? 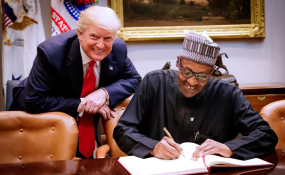 Buhari and Trump - a Chance to Reset Nigeria's Relationship With the U.S.
President Muhammadu Buhari signing the White House register after his arrival at the White House for a meeting with President Donald Trump on Monday, April 30, 2018. The US president Donald Trump Monday said Nigeria has a reputation for "very massive corruption" but insisted that President Buhari's fight against graft in Africa's most populous country is commendable. Both men were addressing a joint press conference after bilateral talks held at the White House. "Nigeria has a reputation for very massive corruption. I also know that the President has been able to cut that down very substantially," Trump said. "We talked about that, he is working on it and they have made a lot of progress and I think they will continue to make a lot of progress." The American president said it was in the best interest of his country and American businesses present in Nigeria that Buhari's anti-graft war succeeds. Trump said, "We have a lot of people in this country that invests in Nigeria, so cutting down on that corruption element and a corrupt element is very important to us and the President will be able to do that." Apart from improved trade relations, Buhari is seeking support in the battle against Boko Haram extremists, who for nine years have attacked cities and towns in the country's northeast, killing more than 20,000 people in a bloody quest to establish an Islamist state. But Trump said he is also focused on the killings of Christians in Nigeria. "We've had serious problems with Christians who have been murdered, killed," Trump said, an apparent reference to the attack on April 24 on a church in central Nigeria, where 18 people, including two priests, were murdered.